Traveling is an exciting adventure and bringing your furry best friend with you can be an adventure within itself. Before you hit the road, there are a few specific safety precautions you should take to make your trip and your pet’s trip safer. 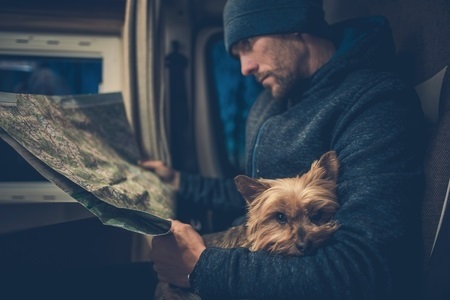 While being spontaneous can add a flare of surprise to your trip, our pets thrive with familiarity and routine; two things that can be hard to come by during an RV trip. Considering the following tips will help gauge your pet’s experience and guarantee their safety. Ensuring your RV is an appropriate temperature is crucial to your pet’s health, especially if you are traveling in the summer months. While turning on the air conditioning is a must, it can’t be your only option when it comes to keeping things cool. If the AC malfunctions, you will need to have a backup plan such as a monitoring system installed that you can access through your phone. Temperatures above 100 degrees can cause heat related illnesses while temperatures below 32 degrees could result in frostbite. Regardless of what type of weather you’re traveling into, you need to be prepared to protect your pet from the elements. To ensure save travels, it is important to know where your pet is while the RV is in motion. Many people suggest keeping your pet in a crate or an enclosed space to protect them from injury in the event of an accident. Many people also believe that restraining your pet, specifically cats when opening and closing exterior doors, reduces the chance of them running off into an unfamiliar location. Lastly, always go outside with your dog. Leaving them outside unattended can make them easy targets for wild animals. For older pets, include a ramp with traction to make boarding and exiting the RV less of a challenge. A lightweight aluminum or plastic ramp is easier to move around and store when not in use. For older dogs and cats, frequent potty breaks and accessible water is a must. Many older pets have decreased bladder control and might need to stop more often. There are countless, cautionary steps you can take to ensure your pet’s safety while traveling in an RV. Planning your next trip? Hemet Valley looks forward to serving you as your source for aluminum RV and travel trailer siding. The Best RV Road Trip Routes in the U.S.